Why don't you linger a little longer? Many people choose to stay in Kanab while they explore some of the most beautiful and dramatic landscapes to be found in the American West. The close proximity to the Grand Canyon North Rim, Bryce Nation Park, Zion National Park and the Grand Staircase Escalante Nation Monument makes it an ideal spot to use as a base. But Kanab is so much more than the cliffs that surround it. Kanab is rich when it comes to things to do and places to visit. It has a long and rich history that can be explored, fantastic dining opportunities, monthly festivals and events, a thriving art community and shopping. So before your head out, why don't you see what else Kanab has to offer? You might find yourself lingering a little longer. ​historical home open for tours in Kanab, there are many other beautiful homes for you to see. You can pick up a walking tour map at the Kane County Office of Tourism. A stroll to all the homes on the map takes about an hour. 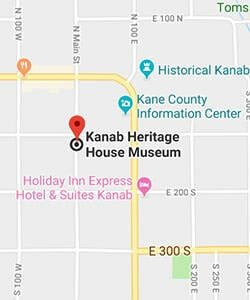 ​​Learn even more about the history of Kanab at the Kanab Heritage Museum. There are exhibits featuring the native peoples that lived in the region as well as the settlers that helped build Kanab into what it is today. ​Film producers and movie stars alike fell in love with Kanab. Due to it's authentic feel and dramatic landscapes many films and television shows were filmed in the area. A visit to the Little Hollywood Museum allows you to explore many of the sets that have been recovered and gives you a glimpse into Kanab's star studded past. There are always plenty of events in Kanab that are sure to educate or entertain. We encourage you to check the online event calendar when planning your next visit to the area. The Rockin V Café has a close connection to the Kanab Heritage House. It was the original site of the mercantile that was owned by Henry Bowman (original owner of the Heritage House). As you visit the Rockin V Café please be sure to notice the safe door that is still proudly proclaiming 'Bowman and Co.' after more than 100 years. ​Houstons Trails End Restaurant is another great dining option. It is great for either a light meal or a real Cowboy supper. It is conveniently located right in the heart of Kanab. ​The Peekaboo Canyon Wood Fired Kitchen offers artisanal pizza from their wood fired oven along with a full menu of international and locally inspired dishes. Vegan and vegetarian options available. ​If you are looking for something with authentic Mexican flavor, then Escobars is the place for you! ​There many other fantastic dining options in Kanab, please go to Visit Southern Utah ​ for a complete list.